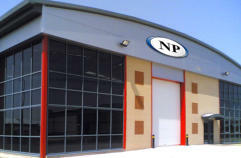 Who we are and What we do NP is a leading supplier of specialist fasteners for sheet metal, inserts for plastics, installation equipment, as well as bespoke bar turned and cold headed components. Established in 1996, the company has built up a reputation for quality, service and reliability. Through the investment in training for our employees, the experience of our technical sales engineers and our customer focused management systems, we have built a reputation for providing high quality products and services to our customers that keep us at the forefront of our industry. With manufacturing partnerships in Europe and Asia we are able to produce high quality products ranging from one-off turned parts, to high volume turned and cold- headed components and offer industry beating lead times at prices that are highly competitive without compromising on quality. We carry our core product ranges in stock, including self-clinching fasteners, broaching fasteners, rivet bushes, blind rivet nuts, weld studs and blind rivets as well as installation tooling and spares. We are authorised distributors in the UK for Arnold & Shinjo Fastener Systems and their range of branded nuts, studs and installation systems including; Pias® and Rivtex® Piercing Nuts, Rivtex® and Strux® Clinch Studs and LCM Machine Tools whose range of fastener installation presses and bespoke tooling solutions such as the Primaserter and Maxiserter, which are user friendly, high quality, cost effective fastener installation presses ideal for installing our self clinching fasteners and rivet bushes. We are committed to supplying quality products backed up with the customer service levels that our customers expect. Our company operates a quality management system and is ISO09001 certified. Quality Policy Northern Precision Limited commits to meeting the expectations of its customers by striving for complete satisfaction first time and every time. In order to achieve its goals, ensuring that its products and services remain competitive and are of the highest quality, top management recognises that the promotion of quality throughout the company and its supply chain is vital. By setting and committing to objectives, the company will comply with all relevant requirements, continually improving its management system and the services it provides to its customers. Top management is invested in promoting a culture in which all employees share this commitment to understanding the importance of quality and the needs of our customers, to deliver products and services that satisfy those needs. To further this aim, the company has implemented a management system meeting the requirements of ISO9001.